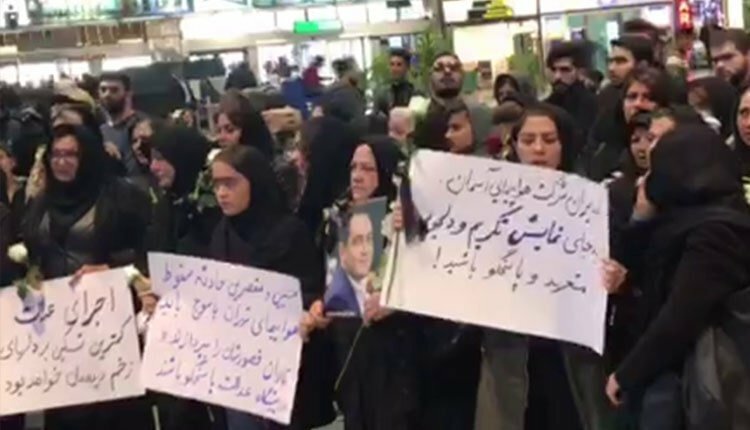 A group of bereaved families gathered in protest on Monday, February 18, 2019, in terminal 4 of Tehran’s Mehrabad Airport. The protesters have lost their beloveds on this day last year, when their plane enroute Tehran to Yasuj crashed. They want the government and airport officials to account on the deaths of their loved ones. On the same day, a group of plundered women, investors of the IRGC-backed Caspian financial institute, gathered in protests in Rasht. The plundered clients of Badr Toos (Caspian) also staged a protest in Mashhad in front of Khorasan Razavi’s governorate demanding their swindled funds. The state-run ISNA news agency reported on Monday, February 18, 2019 on a protest held across from the Majlis (the mullahs’ parliament) against the tests taken for proctorship. The plundered customers of Shadi Goldshop also held protests at Tehranpars district in Tehran in front of the Supreme Court. This gold trade business with a history of 19 years, has defrauded more than 4,000 customers.